The western response to Russian hybrid war in Crimea and eastern Ukraine has been predicated on a show of military force. Nonviolent civilian defence promises us another path. Lithuanian interest in civil defence dates back to their experience of waging nonviolent defence against Soviets in the late 1980s and early 1990s to win independence. 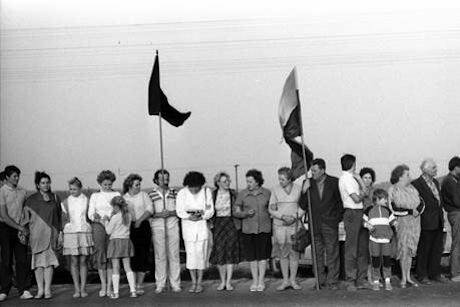 One tactic involving transnational solidarity was dubbed ‘the Baltic Way’ – a chain of people hundreds of kilometres long across three Baltic states, formed to increase visibility of these populations’ struggles for independence. Wikimedia Commons/Rimantas Lazdynas. Some rights reserved. Since the annexation of Crimea and the start of conflict in eastern Ukraine, the Russian form of hybrid war that spearheaded these events has raised significant concerns among eastern European states about an effective response to non-traditional warfare. Russia’s hybrid war – a term meaning a mixture of conventional and irregular warfare – has presented a vexing problem to conventional armed defense. It also demonstrates the need to determine whether a national strategy of nonviolent civilian defence can be a viable option for the current and potential victims of hybrid war to fight back non-militarily. The meeting between former Russian and US defence and intelligence officials in March gave us a glimpse into the Kremlin’s thinking about hybrid war. Instead of sending troops without insignia across the border with the Baltic states, Moscow would use at first non-military means to entice local, mainly Russian but sometimes non-Russian populations (like the Polish-speaking minority in Lithuania) toward Russia. This would hardly constitute a rationale for deployment of tanks and warplanes and would put a defending military in a dilemma of whether or not to shoot at unarmed civilians. As the commander of the US army in Europe, Lt-Gen Frederick "Ben" Hodges observed recently: Russians “don't want a clear attack, they want a situation where all 28 [NATO member countries] won't say there's a clear attack." If the alliance decided to go heavy-handed against mobilized and seemingly peaceful minorities it would turn itself into an aggressor, offer Putin a propaganda coup for more interference and rally Russian society even closer around the Kremlin’s belligerent policies. Despite facing such unconventional threats, the western response has been predicated on a show of military force, while nonviolent strategies have largely been absent from defence plans. The most recent Operation Dragoon Ride publicity stunt saw hundreds of US soldiers and their armed vehicles meandering through the roads of central Europe in a public display of force. Meanwhile, countries such as Poland have beefed up their armouries while civilians have volunteered to join shooters’ clubs and paramilitary groups to prepare for potential armed resistance. The choice society has in facing foreign aggression seems rather simple: fight with arms or surrender. That sentiment was reflected in the 2014 Gallup survey conducted in more than 60 countries that asked: “Would you fight for your country?” Globally, 60 percent were willing to fight or, as it was interpreted, “take up arms,” while 27 percent would not. By default, “fight” was understood as armed struggle while its opposite – not to fight – as a capitulation. A recent opinion poll in Poland, however, showed a far more nuanced gamut of responses. Last month, the survey asked Poles what they would do if their state faced armed invasion by another country. Tellingly, 37 percent of respondents – the equivalent of almost 12 million Polish adults if applied to the nation’s population – said they would resist foreign aggression “not by fighting with arms, but by engaging in other, non-military activities.” Only 27 percent declared it would take up arms. The remaining would emigrate, were undecided or would surrender. Many more Poles – a population that could very well find itself in Russia’s crosshairs – are ready to engage in nonviolent resistance than in armed struggle to defend their country. While at first blush, Gallup’s global survey suggests the default is armed struggle, responses by Poles indicate that when given more choices, nonviolent resistance has more support than is often recognized. That point is not lost on Russia and China. My study published by the Krieger School of Johns Hopkins University in March 2015 on countering hybrid war with nonviolent civilian defense shows that these countries are preoccupied equally with shielding themselves against nonviolent resistance, while at the same time using civilian mobilization to propel their hybrid war machines. The new Russian military doctrine released at the end of 2014 identifies social movements and civilian-led demonstrations as a major weapon in territorial conflicts. This strategy is no doubt the result of Russia’s lessons from the so-called colour revolutions, the Arab Spring and the Ukrainian Euromaidan. Nonviolent resistance as part of a nation’s defence strategy? Lithuanians recognized that nonviolent civilian defence could turn a whole nation into a resistant society as it strengthens its cohesion, solidarity and self-organization – essential ingredients in a struggle against a polarizing hybrid war. Nationwide, nonviolent civilian defence turns the whole nation into a fighting society that is disciplined to wage a long-term, all-encompassing and targeted noncooperation effort with the aggressor, including its allies at home and abroad to disrupt their control and undermine their legitimacy in each area of social, political, economic and cultural life. Seemingly weak, occupied populations have in fact been able to exercise direct and indirect leverage over the occupiers when they engaged in nonviolent resistance. The experience of the past anti-colonial and anti-occupation struggles suggests that civil resisters were most effective when they were able to look beyond their domestic struggle and extend their immediate battlefield outside the borders to mobilize external actors, including adversaries’ international allies, as well as drive a wedge between the aggressor’s government and its own society. As a result, organized collective actions of millions of ordinary people were able to erode the loyalty of the adversary’s allies often more effectively than arms. During the occupation of the Ruhr after World War I, German citizens were so effective in nonviolent outreach to the occupying French troops that Paris was gravely concerned about their loyalties and readiness to continue implementing occupation orders. This and other civil resistance actions forced the French government to call up reservists, which increased the cost of occupation, deepened the budget deficit and raised resentment among the French public. Civil resistance has also undermined oppressors’ domestic constituencies, as it did during the Indian independence struggle when Gandhi effectively reached out to the British media and the public to put pressure on the British government. Similarly, during World War II, civil resistance by the Norwegian teachers and trade unions against the pro-Nazi Quisling regime, the Danes’ collective nonviolent actions against the Nazi occupation, the first Palestinian nonviolent intifada against Israeli occupation and the East Timorese nonviolent pro-independence struggle against the Suharto regime were all credited with protecting civilians, and reducing civilian deaths particularly in comparison with violent resistance. Nonviolent resistance also increased the economic, political and social costs on the violent adversary, often forcing it to offer tangible concessions that were hardly likely to have been extracted through direct violent challenge. At its core, nonviolent civilian defence is about engaging the greatest number of people with the least amount of risk for civilians and greatest number of disruptions for the adversary, including its key domestic and international supporters. Historically, nonviolent resistance has worked far better than its armed alternative. Civil resistance has been determined to be twice as effective against a violent adversary than armed struggle, able to mobilize campaigns that are 11 times larger than average armed resistance ones, likely to reduce civilian deaths and tenfold more likely to bring about a democratic outcome compared to a victory though arms. The untapped powers of nonviolent resistance offer a serious alternative against the threat of contemporary hybrid wars. Furthermore, as shown in the Polish survey results, pursuing this form of waging conflict might match people’s own instincts in the face of external aggression. When it comes to mobilizing the masses, enhancing internal solidarity and unity, limiting overall human costs, maximizing strategic effectiveness of disruptions to a foreign adversary and increasing chances for post-conflict stability, democracies would do well to take note of the potential that nonviolent civilian defence holds for their defensive capabilities to counter protracted hybrid wars. This is particularly relevant to smaller nations and their populations vulnerable to external threats from authoritarian states who are equally afraid of people power and eager to manipulate it to their benefit.